It's that time of year when we're thinking of what kind of gifts to select for the teachers, to thank them for all they put into our children during the school year. I recently came across Ben's Garden, and it was the first I'd heard of them. It looks like I'm way behind times on this one, because a lot of people are raving about the items, including those on the famous A-lists. Never mind that I'm (fashionably) late to the party... I'm here!! I'm here!! And boy, do they have some really nice selections to sort through; some I'm sure the teachers would love to have as nice thank-you gifts! It all started back in 1992, when Ben Busko was just 8-years-old, selling découpage inspired by his garden. Armed with a paint brush, Ben developed his design sensibility and technique piece by piece using imagery, a colorful palette, and words in entirely new ways...and so, BEN’S GARDEN was born. Ben’s charming designs are individually handcrafted entirely by hand in New York City. His decoupage pieces are all signed. What began as Ben’s passion for sharing his colorful and thoughtful world transformed into opportunities for his customers to share a bit about themselves, surround themselves with things they love, and to share a bit wit and an appreciation for fashion. Each piece tells a story. His special handmade pieces mean something to the person who buys them and it tells their own story. It all wonderfully results in turning a house into a home! Today you can discover Ben’s refreshing & captivating collection of unique home, garden, gift and charm in the celebrated Ben’s Garden shops; a very select group of exclusive and well curated boutiques in New York, more than 800 boutiques across the United States, and internationally in every time zone and every continent. Ben Busko has demonstrated his decoupage technique to Martha Stewart on her Television show, had one of his designs selected as an Oprah “ O –List Must Have” product, and his designs have been featured in a number of prominent periodicals including House Beautiful, In Style and Architectural Digest. You can reach Ben’s Garden at www.BensGarden.com or calling 1-888-922-7646. These are also great for teacher gifts. We gave this paperweight to my son's assistant teacher as a going away present at the end of the year, and she just loved it!! It's nice and heavy and a smooth, heavy crystal that feels good in your hands. 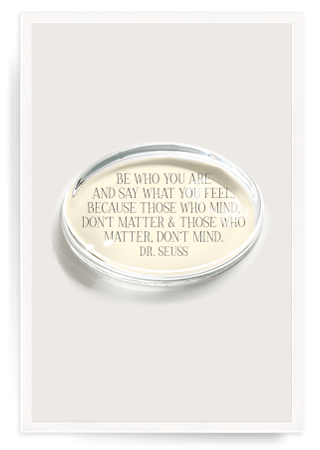 And it's got the great Dr. Suess saying on it. :) It has a nice felted back so it will not scratch any surface where you place it. The paperweight retails for $34.00 at Ben's Garden and is sure to last for years to come. 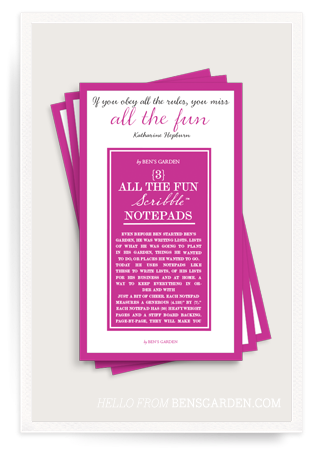 The All the Fun Scribble Notepads are made of a high quality, heavy paper that is bright, fun, and festive. Just the right size for scribbling notes, the saying on the top says, 'If you obey all of the rules, you miss all the fun.' 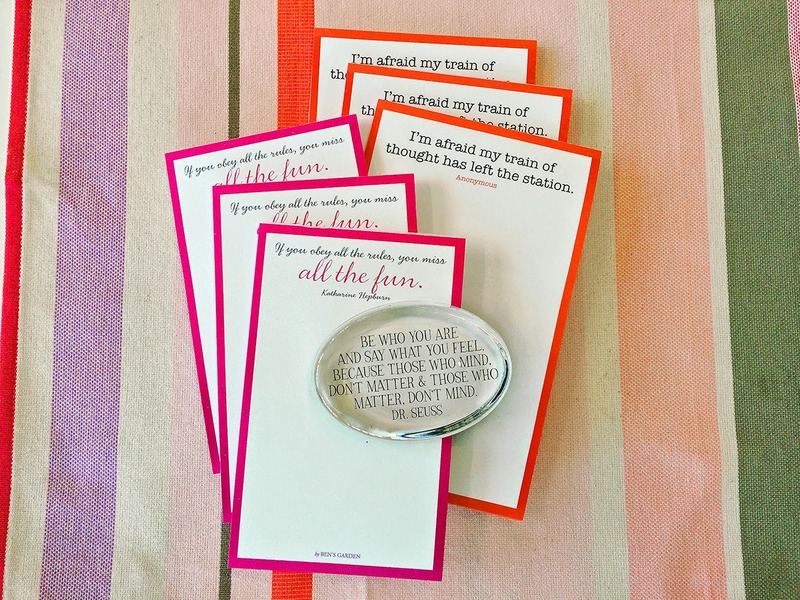 Such a cute, fun saying, and also a great gift idea!! Hilarious Scribble Notepaper from Ben's Garden is sold here. The final product in the giveaway is hilarious to me because I can so relate!! 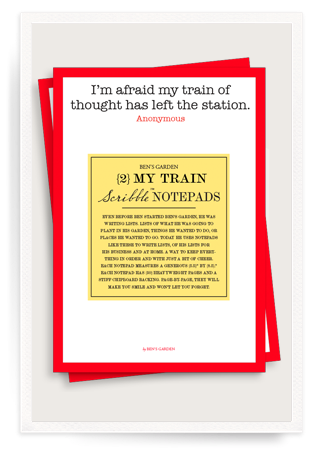 The top of the heavy notepaper says, 'I'm afraid my train of thought has left the station.' That's so me if I don't write a list!! BUT not to worry, because with this gorgeous pad of paper (Scribble Notes) I won't be forgetting a thing! This paper is also heavy, and very high quality. It's a nice, generous size too! One lucky winner gets to take home all three of the items reviewed! The give­away starts 6/1/14 at 12:01am EST and ends 6/15/14 at 11:59pm EST. It is open to United States Res­i­dents 18 and over. Win­ners will be selected via random.org and noti­fied via email within 48 hours after the draw­ing. Win­ners will have 48 hours to respond or a new win­ner will be selected.The winner's name will be dis­played via the Raf­fle­copter wid­get below. I'll have to check them for gift ideas. My niece is graduating soon! I love the trays. Especially the "stick around I may need someone to blame" one. These all look like thoughtful gifts and it would be hard to decide. What a lovely way to thank a teacher for all they have done for your child throughout the year. Wow, they have such a large selection of gifts for dad, the grad or for any occasion. I love the desk set, how cute! "My train of thought has left the station" - LOL!! That's me!! Will Have To Check It Our I Have A Lot Of Friends Kids That Are Graduating Thank You! These are such nice gift ideas! I really love the desk set! They have such nice gift ideas. They are definitley perfect for Father's Day and new grads! My son is going to be a senior next year, I am not ready. I love that set, it looks perfect for my desk! I think it is so cool that the company started with an 8-year-old. I love stories like that. The desk set is really neat! I love office supplies so this is something I would enjoy. I collect note pads and pens like candy. I like THE TEACHER oval paperweight. These are perfect gifts, I would love to have the desk set.